Are you searching for an easy and delicious way to get your kiddos to eat (and enjoy!) more veggies? Well, look no further! 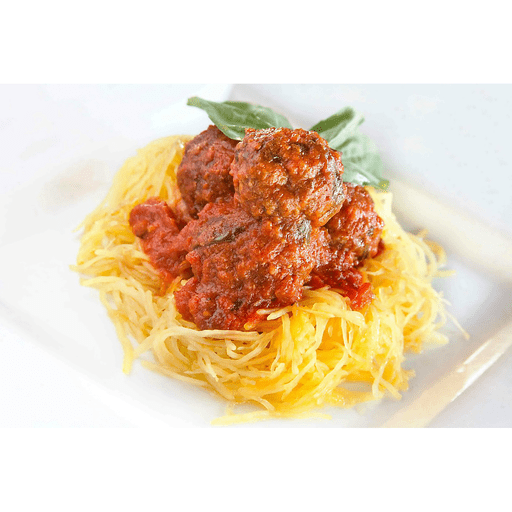 Because … it’s spaghetti (squash) and meatballs time! This simple twist on a classic, family favorite is ready in no time, thanks to quick and easy microwaved spaghetti squash that tastes great! And, your kids will love helping shred the “spaghetti” once it’s cooled enough to handle. 1. Halve squash lengthwise and scoop out the seeds. Place face down in a microwave safe dish. Add water. Microwave uncovered until flesh can easily be scraped with a fork, about 10-15 minutes. 1. Meanwhile, add ¼ cup Parmesan cheese, Italian seasoning and turkey to a large mixing bowl. Gently mix until evenly distributed and form into 12 meatballs. 1. Heat 1 Tbsp. olive oil in a large nonstick skillet over medium-high heat. Add the meatballs and reduce heat to medium. Cook meatballs, turning occasionally, until browned all over. Add pasta sauce and bring to a simmer. Cover and cook, stirring occasionally, until the meatballs are done, about 10-12 minutes. 1. Once squash is done, shred into a bowl. Add remaining ¼ cup Parmesan cheese and 1 Tbsp. olive oil. Stir to mix. Season with salt and pepper, as desired. Top with cooked meatballs and sauce. For dairy free: Omit Parmesan cheese. Calories 410, Total Fat 22g (Saturated 6g, Trans 0g), Cholesterol 95mg, Sodium 330mg, Total Carbohydrate 26g (Dietary Fiber 6g, Sugars 15g), Protein 29g, Vitamin A 30%, Vitamin C 15%, Calcium 25%, Iron 20% *Nutritional values are an approximation. Actual nutritional values may vary due to preparation techniques, variations related to suppliers, regional and seasonal differences, or rounding.